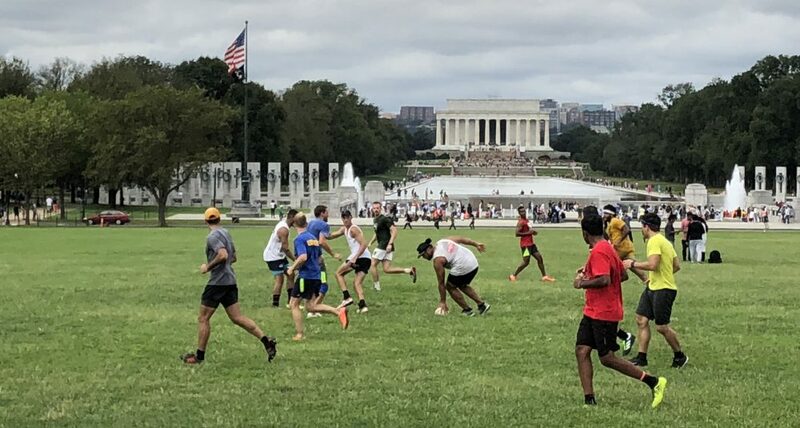 Rugby’s on for 6:00 PM today at the typical spot (17th and Constitution). Sunset today is at 6:45, so we clearly only have a couple Wednesdays left in the season. Let’s get out there while we can. Bring balls. Bring the cones. PS, I’ve been gone the past two weeks (Cody’s been posting in my absence if you haven’t noticed) and I’m unsure whether the 17th and Constitution field has been occupied by the plague that is softball. If it’s been an issue and we should consider going back to 15th and Constitution, let me know. Otherwise, see everyone at 6:00! Hey guys, would anyone have any interest in a) showing up 30 minutes early on Saturday or b) coming out for a Sunday morning session to spend a little time on basic skills, strategy and tactics? I’ll send out a note for those interested to show up at 9:00 am on Saturday if they want to get in a skills and strategy lesson.